We are so happy to announce our partnership with U.S. English Foundation Inc., one of the largest US educational foundations that promotes the role of English language, helps disseminate information on English teaching methods, sponsors educational programs and so on. 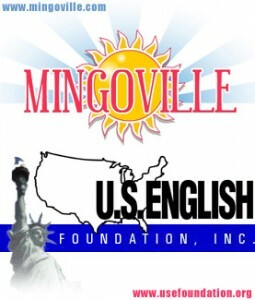 Mingoville is made available to all kids residing in the US via the Foundation. We hope that we at Mingoville make our contribution to solving problems at this level. This entry was posted in Partners and tagged children, ESL, Learn English, U.S. English by . Bookmark the permalink. I want to know English language too. So need that type of help which depend on I can use English language to talk to other. I want to know English. So disparately chasing your help to learn the same.